Do you have any paths listed in the Plugin Support Folders section? If so remove them all, then click the Authorise Global button, then Authorise again from the Finder window that will open. You should only see a forward slash in the Plugin Support Folders field. 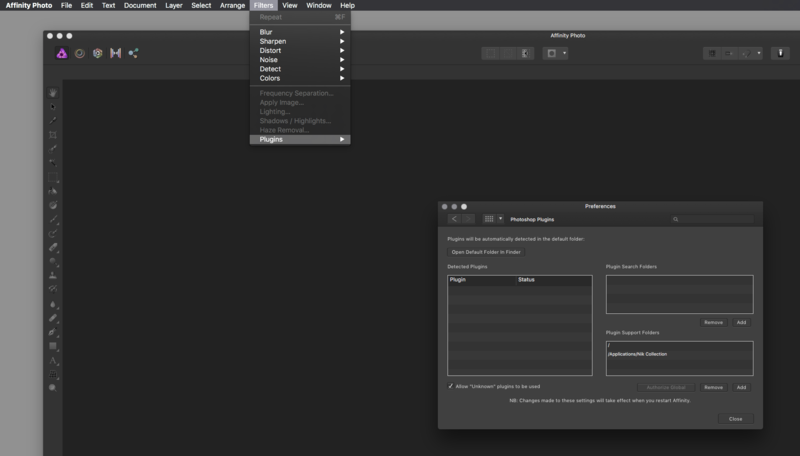 If you still have trouble can you please post a screen capture of the Photoshop Plugins preference window? OK... Remove all references to folders, etc.. Authorized Global... Authorized from Finder window and saw forward slash in Plugin Support fields. Same result no NIK. Repeated process to show Folder where NIK apps reside with same no show results. I did not delete the slash and re-authorize Global before adding the NIK folder. OK, same result... See screen shot. I tried to open a NIK app by right clicking on a afphoto file in my storage directory. Under Open With Affinity Photo was shown and Other. I selected Other and went to the NIK directory where all NIK apps were grayed out. This tells me Affinity no longer is recognized by NIK? 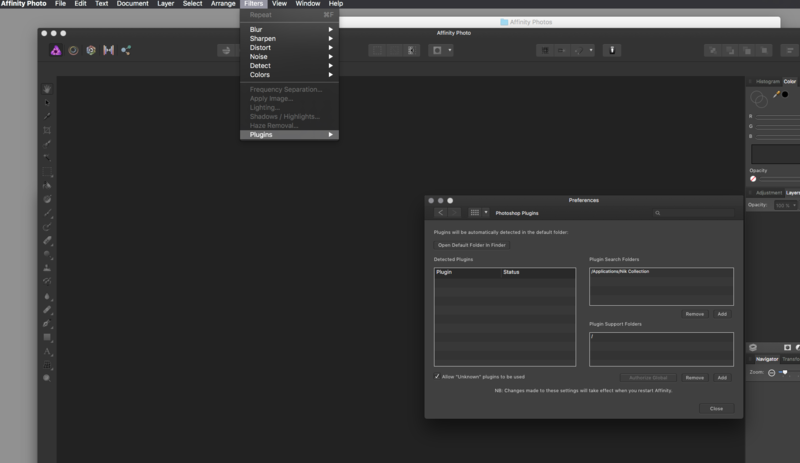 Also I tried using Affinity to open a NIK plugin with a JPEG file to no avail. I will now check out the video reference in your post. The path you have set in the Plugin Search Folders is incorrect. It's pointing to the standalone/apps versions of the plugins and not to the plugins themselves. Usually the plugins are installed inside a folder called Google (each one in its own folder) and have the extension .plugin. Have you checked the video tutorial i linked above? If not please do so. It will help clear things up. When in LAB (16 bit) mode, I have noticed that the Nik filters are not available (greyed out). Is this normal? Yes, it's normal. The NIK Collection only works with RGB modes (8/16bit). I haven't tried the DxO installer/version yet, but i suppose it works the same way. Will have to check that one too. Thanks for pointing it out. OK, downloaded NIK collection from the Google website. Installed download and found Affinity app grayed out again. After installation I could find no NIK plugins on my hard drive. Also, as stated previously, right-clicking on a .afphoto file will not allow me to open the file with the NIK apps. So... dead end there and no way to use NIK with Affinity Photo at this time. The download version of NIK Collection was created July 13, 2015. I think it's the same as downloaded from DxO website. Are you following all the steps shown in the video? In particular the part that starts at 00:34s, where James create a new folder to install the plugin files (he created this folder on Desktop and called it Plugins)? 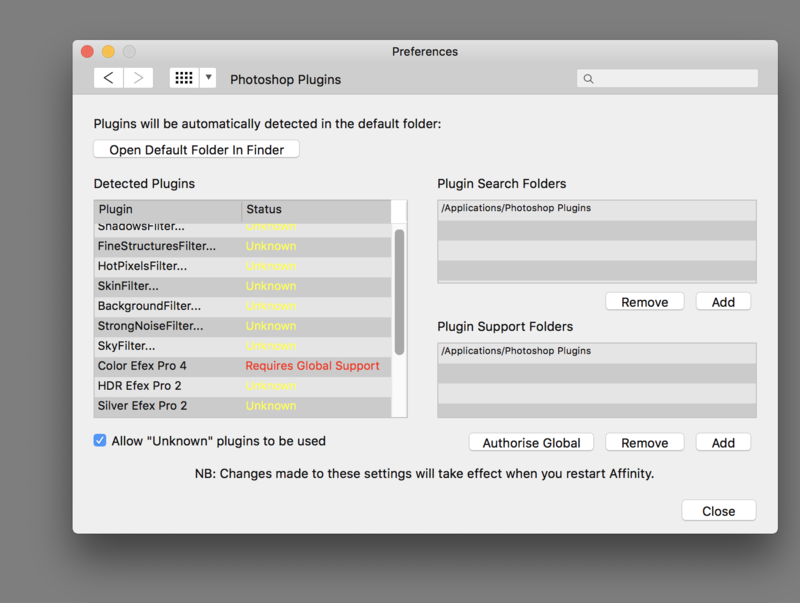 This is the path that you must use in the Plugin Search Folders in Affinity Photo Photoshop Plugins Preferences. The NIK installer doesn't detect out app, so unless you have another host application that's automatically detected by the NIK installer (like Photoshop) you have to create that folder manually so NIK installs the plugin files there and then point to it from the Plugin Search Folders in Affinity Photo Photoshop Plugins Preferences. It doesn't matter where I install - yes, I followed the video - the current download does not install ANY plugins, just apps. Those apps will not accept Affinity files by right clicking on a afphoto file a NIK app is not presented. Think this may also be causing my problem. Press and hold ⌃(ctrl) while launching the application from Launchpad or directly from the Applications folder until a Clear User Data dialog appears. Remove the ticks for Don't restore window and documents and Reset Studio. Leave only Clear User Defaults checked then press Clear. This will fix the crash issue. - Go to the Photoshop Plugins dialog in Affinity Photo Preferences and set it up again this time pointing to the folder where the plugin files where installed in the Plugin Search Folders section. - Click the Authorise Global button, then Authorise again in the Finder dialog to add the forward slash to the Plugin Support Folders. - Finally tick Allow "Unknown "plugins to be used, close the Preferences dialog and restart Affinity Photo. You should then be able to open an image in Affinity Photo (Photo Persona) and go to the menu Filters ▸ Plugins and launch the plugin you want from the NIK Collection. If you still have trouble getting the plugins running please post a screenshot of the Photoshop Plugins dialog (in Affinity Preferences) so we can check how you have set it up. I have deleted V1.6 from my hard drive. I restored V1.5 from Time Machine and followed the video to install NIK from Google (not DxO). Everything works fine. The NIK programs are available in Affinity. Open the Mac App Store, go to the Updates section on top, then click the Update button in front of Affinity Photo on the list below. The application should then launch correctly. After this you don't have to install the NIK Collection again. You just need to configure the Photoshop Plugins preferences in Affinity Photo exactly as you have now - assuming that is now working correctly in version 1.5 judging from you last post. OK, did as advised. Updated to Affinity Photo 1.6 from APP Store. After starting V1.6 I could not access the preferences. Program just would not respond to clicking Preferences. Closed the program and opened again from Launchpad w/ CTRL pressed and unchecked as advised. Then re-installed NIK as advised. Glad to know it's all sorted out. ok, muchas gracias por sacarme del apuro. he seguido tus pasos y funciona!!! puedo seguir esperando sentado la respuesta de Apple. Gracias de nuevo. I'm having exactly the same problem as HarryBH in getting Nik Collection to install properly. I've watched the video umpteen times and am sure I am doing everything correctly. I have Adobe Photoshop Elements and Lightroom installed were Nik works perfectly. I've completed uninstalled the Nik filters using its uninstaller. I've uninstalled Affinity Photo and downloaded it again. Then I downloaded Nik again; during installation Photoshop Elements and Lightroom showed and I added the Plugins Folder which I had created. After installation Elements and Lightroom worked fine. The Nik collection was showing in the folder I'd created. Affinity Photo Preferences showed all the filters but two showed as requiring global support the rest were shown as unknown. I've done what it said in the video and restarted but whit no effect. Help please.